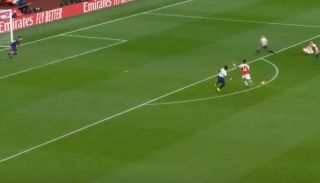 Arsenal have levelled it up in the North London Derby with a Pierre-Emerick Aubameyang wonder-goal from just outside the box. Watch the Aubameyang goal video below as the Gabonese forward absolutely lashes home an unstoppable curling effort first-time after pouncing on a loose ball. The former Borussia Dortmund man is having a fine game today, despite some fans being hugely critical of him for an unconvincing first half display in which he scored a penalty but missed some other big chances. He’s shown them his quality now with this equaliser in a thrilling derby at the Emirates Stadium.